I have not been in the mood to do much cooking lately. Between law school, my part time job, studying for the GMATs and completing my essays for the MBA application, I’m only interested in quick recipes with refrigeration power. That is why I love this recipe and the ones I’m going to introduce over the next few weeks. From start to finish, this really did only take me about 35 minutes to make. It might take you a little longer the first time around, but it will still make enough pasta to last for a few days. If you combine it with roasted chicken, it will last even longer. Todays recipe was brought to you courtesy of the fine ladies at BGSK. The main difference between my version and theirs is a change in some of the proportions and avoiding a few steps for the sake of time. 1 box of Linguine or Fettucini: Its a whole sale lie if I said I could taste the difference between the two noodles. 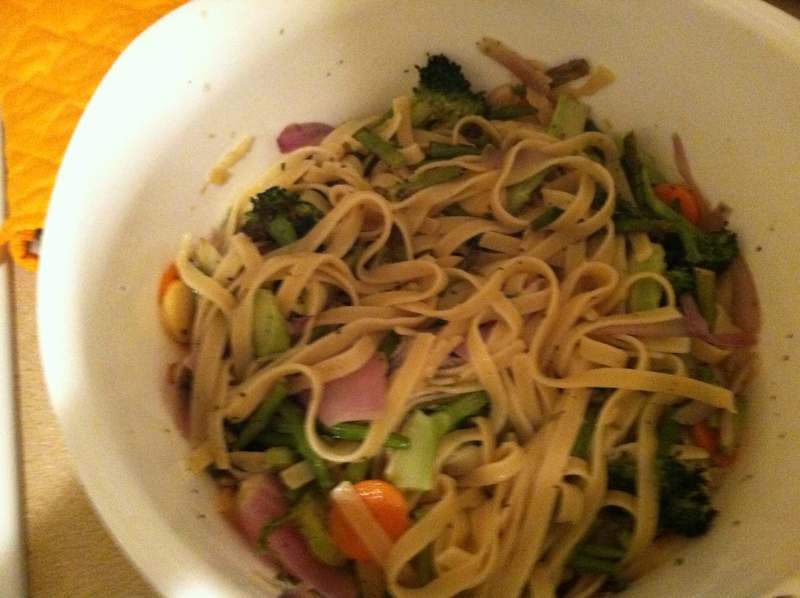 1 Onion: I used a red onion in this recipe only because I was trying to get rid of it. I would recommend using a sweet onion the first time around. 1 Bunch of Asparagus: I personally prefer half of a bunch only because I tend to run out of noodles when I use the whole bunch. If the asparagus is thin like the ones I purchased at Winco, don’t worry about chopping them up. If its like the thicker ones I got at Safeway, cut them it into 2in pieces. 1 Head of Broccoli cut into smaller pieces: it doesn’t have to look pretty, it just has to be edible. If you’re the kind of person who likes to have all the ingredients prepared before you start cooking, great. If you’re like me and do nothing until the instructions tell you to, thats fine as well. In fact, a lot of my instructions are made with this approach in mind. My timing is based on doing everything in a certain order and cooking several things at once. 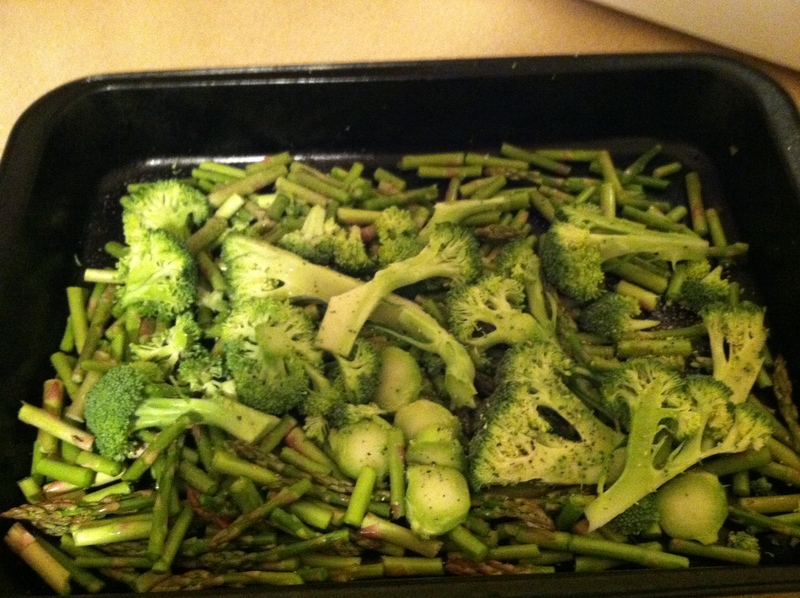 Place the asparagus and broccoli into a baking pan, toss with 2 tablespoons of olive oil and a dash of both salt and pepper. Cook in the over for thirty minutes. While this is going on, chop up the onions and garlic and sauté the two in the remaining 2 tablespoons of olive oil over a medium heat. 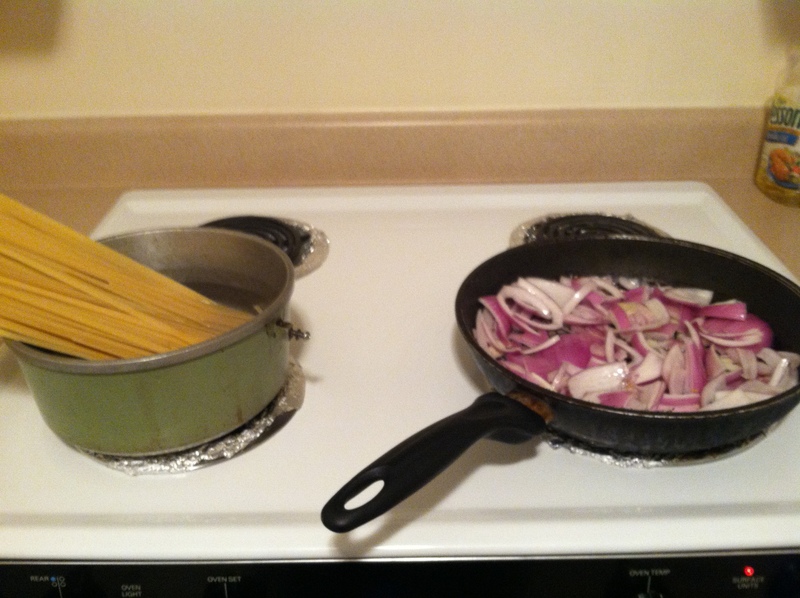 Once you have the onions and garlic in a pan, start cooking the noodles. What I normally like to do is just fill up a pot at least half way with water and throw the noodles in with the burner on high. Since I usually cook a few things at once, its just a matter of keeping an eye out on everything to make sure nothing over cooks. If you place the noodles in the pot they way I did in the picture, don’t worry about noodles cooking unevenly, they usually turn out fine. Like I said, make sure you watch the noodles and once all of it is underwater, don’t forget to stir. Of course, there is always the option of actually following the directions on the box of noodles… Which probably is for the best. Regardless, don’t forget to stir the onions every now and again. While the onions are cooking, chop up the carrots. 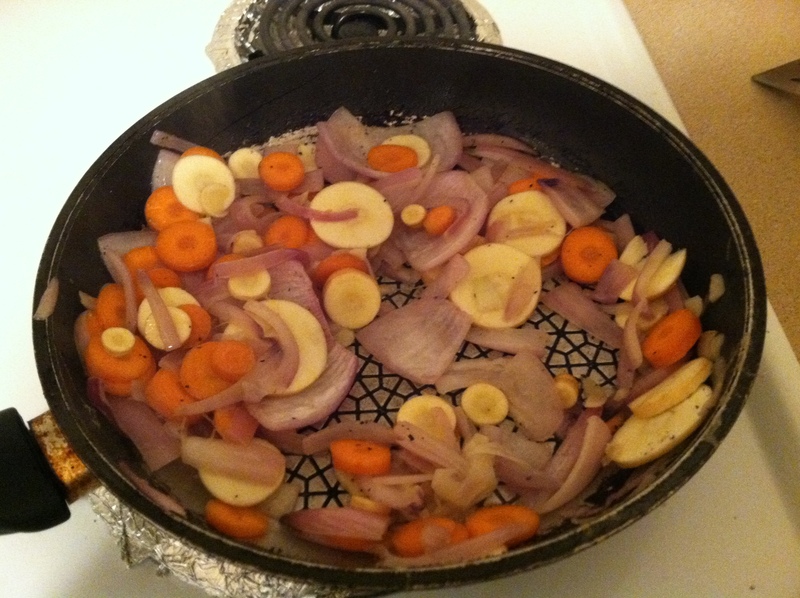 By the time you finish with the chopping, the onions should be soft enough to add the carrots, salt and pepper. If not, keep sautéing them until a majority of them are soft. Once you’ve added the carrots and/or parsnip, you’ll want to cook them just long enough give them flavor, but not so much that they lose their firmness. I would describe it as being firm without being crunchy. Set this mix aside. By this point, the 30 minute mark on the asparagus and broccoli should be complete. Once everything is done, toss the noodles, asparagus and carrot mix into a giant bowl. The best way to avoid uneven distribution is to pour in layers. In other words, place some noodles into the bowl, then the carrot mix and then the asparagus mix. Toss those items together and start the process over again. As for the optional ingredients, sometimes I like to add the arugula and spinach to the entire dish and sometimes I only add them to an individual bowl. The parmesan I keep separate because I’ve noticed that parmesan is on of those things that can only correctly be applied on an individual basis. Either way, try combining the two on an individual bowl basis first.